A Certain Ratio - I'd Like To See You Again. Vinyl LP. Bleep. 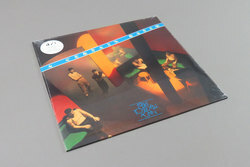 Trailblazing funky punks A Certain Ratio are having their albums reissued by Mute at the moment, the latest of which is their 1982 entry I’d Like To See You Again. Originally released by Factory, the group’s fourth LP shows off the full array of what the post-punk pioneers were capable of. It begins with one of their all-time classic grooves. In the popping bass, serrated-edge guitar and disco stomp of ‘Touch’ you hear the beginnings of everything from !!! to early Red Hot Chili Peppers. Across the rest of record we get weirdo-funk reminiscent of This Heat (‘Saturn’), dark takes on Philly soul (‘Hot Knights’) and fey art-punk that doffs a cap to contemporaries Orange Juice (‘I’d Like To See You Again’).